George Dyke was born in Yeovil in 1839, the son of cooper George Dyke (1809-1885), originally from Taunton, and Amelia née Fox (1807-1887), a milliner. In the 1851 census George and Amelia were listed in Middle Street, close to the Triangle, with their daughter Eliza aged 14 and George aged 11. By 1861 the family were living in Bond Street where George Snr gave his occupation as a cooper, Amelia gave hers as milliner & dressmaker, daughter Amelia Ellen (presumably Eliza's real name) described her occupation as a milliner also while George Jnr gave his simply as a turner. 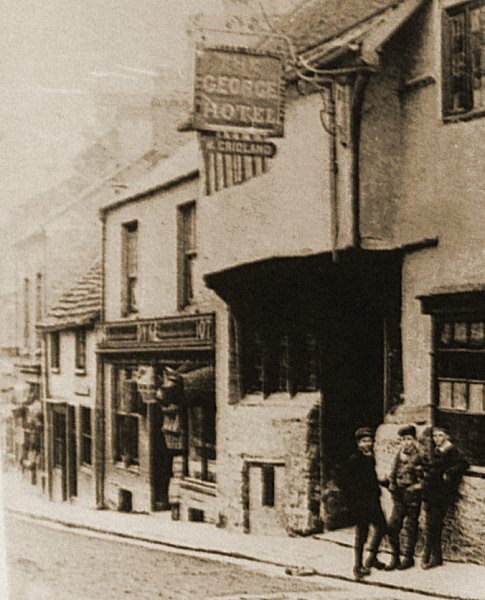 By the time of the 1881 census George, Amelia and 31-year old George Jnr were living back in Middle Street but this time in a small two-storey shop, photographed below, immediately next door to the George Hotel. George Jnr gave his occupation as 'hollow turner'. At the time of the 1881 census George was visiting his sister Amelia in Exeter where she lived with her husband and seven daughters. George described his occupation as a turner and cabinet maker. In the autumn of 1882 in Yeovil, at the age of 43, George married Harriett Henrietta Morrish, a preparatory school mistress of 12 Peter Street and the daughter of James Morrish and Hannah née Hawkins. His father, George Snr, died in 1885 and his mother Amelia died two years later and George took over the shop at 107 Middle Street. The 1891 census listed George and Harriett living above the shop with their children; Edith aged 7, Mary aged 6 and George aged 5. In this census George listed his occupation as wood turner & cooper and examples of his barrels appear in the doorway of his shop in the photograph below, alongside boxes and other items he had made. George was still at the shop in 1896 (the date of the photograph below) but by 1901 he had moved his family to Gloucester. George died in Gloucester in 1912, aged 74, and Harriet died in 1914 at Newent, Gloucestershire. 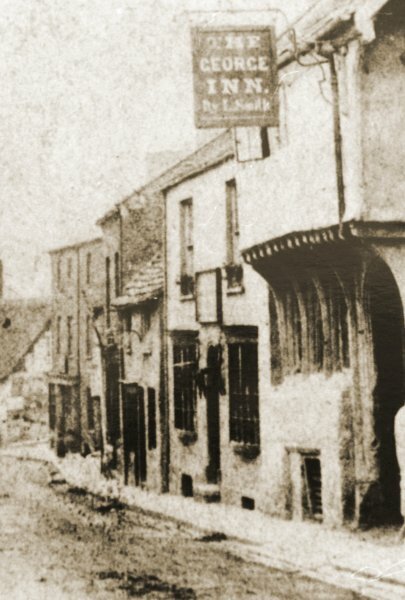 This photograph was taken in 1871 (when Louisa Smith was licensee of the George Inn) but it is not clear if George Dyke was at his shop, seen here at the centre of the photo, at this time. This photograph dates to 1896 (during William Cridland's brief tenure as landlord of the George Hotel) and shows George Dyke's shop premises, with his name over the door, next door at 107 Middle Street. The shop front has had a re-fit since the previous photograph of 1871 and now displays a selection of barrels, boxes and other items he had made himself. George and his family lived above the shop. As a sidenote - in 1891 the really tiny house at far left (looking like a Wendy house compared to those either side) was the home of glove sorter Edward Lewis, his wife Caroline and daughter Mary, a dressmaker. All three must have been vertically-challenged in order to live there!